Nigerian Governors are clueless on what to do with public funds and go about using for it for the most ridiculous reasons, so this report may seem. 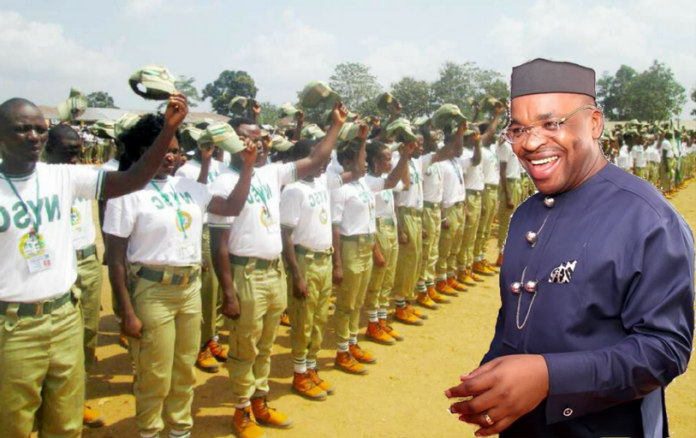 Recently, the Governor of Akwa Ibom State, Mr Emmanuel Udom invited all the National Youth Service Corps (NYSC) members serving in Uyo LGA to converge at the Akpabio International Stadium for the opening ceremony of the 3rd Inter Nigerian Airforce Combat Sports Competition tagged, Uyo 2018, which had the Chief of Air Staff, AVM Saddique Abubakar in attendance. Reliable sources confided in Secret Reporters that the corpers went as forcefully instructed. They were told bluntly to be in their ceremonial dress for the meeting as the governor will be coming with other state stakeholders and Commissioners. “I’m directed to inform all serving corps members, serving under Uyo local Government to converge at the AKPABIO INTERNATIONAL STADIUM tomorrow by 7:30am all in ceremonial dress (i.e) 7 over 7, where the State Governor of Akwa Ibom State, HIS EXCELLENCY, MR UDOM EMMANUEL will be on ground and other state stakeholders with the state coordinator”, read a message sent to the Corp members. The corpers were all also threatened with sanction if they don’t comply with the above instruction. Unknown to them, their presence was just to fill the stadium space. On the day for the slated meeting, we gathered authoritatively that Mr Udom gave N300,000 (Three hundred thousand Naira) to the Commissioner for Transport and Petroleum Resources, Mr Urman Esin, which was to be shared to the corpers. At the end of the event, the sum of N450 (four hundred and fifty Naira) was shared to the each of the corpers. One of the obviously angry corpers speaking on this ridiculous act, told Secret Reporters that since getting fifty Naira change was a problem, the distributors of the money resorted to giving each corper N500 (five hundred naira) and getting N50 (fifty Naira) change from them.